Among the many physiological responses to swimming in cold water that have been suspected of contributing to the high incidence of deaths in the swim portion of triathlon are three unusual entities: two of which are uncommon (less than 2% of the population), and one which is quite rare. Now, take a deep breath: no need to be afraid of either of these, but the medical terminology gets thick here. The Long QT Syndrome/Torsades de Pointes. The “LQTS” is an uncommon electrical disturbance of the heart that can be inherited or acquired, that can adversely affect the contractile functions of the heart. It is often referred to as a “channelopathy”, as it is characterized by abnormalities of the ion channels that pass ions (such as potassium, sodium, calcium and chloride) across the cell membranes in the process of depolarization and repolarization. When these channels operate abnormally, the repolarization of the cardiac process on an EKG is prolonged (the QRS complex, followed by the T wave), hence the name long QT interval. When the repolarization process is prolonged, the risk of re-entrant ventricular arrhythmias is increased; the most dangerous one is called torsade de pointes, so-called because it looks like twisting up and down spikes, an unstable cardiac rhythm which is usually symptomatic (dizziness, fainting or seizure) and can just as quickly revert back to normal or lead to a fatal arrhythmia called ventricular fibrillation. Symptomatic LQTS is more common after age 40, and is somewhat more common in women. Most people who have the LQTS are unaware that they have this vulnerability, but it is relatively easy to screen for it, with 85% of them appearing on a routine EKG, and simple genetic blood testing can be considered in other suspected cases. If there is any family history of LQTS, of sudden death, or other genetic cardiac abnormality, a cardiac assessment including an EKG and possibly a stress test would be a good first step in most cases. However, where LQTS gets interesting is when it is realized that the majority of LQTS incidence is acquired. According to the Mayo Clinic, more than 50 medications are known to lengthen the QT interval (many more are suspected): Antihistamines, decongestants, antidepressants, some antibiotics (macrolides and quinolones), cocaine, diuretics, heart medications, cholesterol-lowering medications, some diabetes medications, some antifungals and some antipsychotic drugs make the list. Electrolyte imbalances such as low levels of potassium, magnesium, and calcium are also common triggers of LQTS, and can be the result of poor nutrition, anorexia nervosa, and even a simple diarrheal illness. Besides a pre-screening EKG, a medication review with a physician or pharmacist is useful to confirm that there is no risk from medication use and a consideration of a stress test to see if the LQTS or any cardiac ischemia develops under conditions of increasingly intense exercise. With both training and racing, be well nourished, and avoid discretionary medication use, especially on the same day of your activity. And if you have been ill, potentially starting your event energy- or nutrient-depleted, dehydrated or exhausted, you should reconsider your participation until you are better. This cardiac syndrome is a congenital cardiac disorder that is relatively common and usually asymptomatic; it is found in about 2-4 people per 1000 population and is more common in males—and it is suspected that many do not know that they have it. In WPW, there is an extra connecting pathway between the atria and the ventricles in the heart, that can at times “pre-excite” the ventricles to contract prematurely, leading to palpitations, tachycardia, dizziness, weakness, and shortness of breath. These symptoms can first appear at almost any age: The tachycardia can be provoked by exercise, and can provoke various secondary arrhythmias, including supraventricular tachycardia, atrial fibrillation, and atrial flutter – these in turn increase the risk of ventricular fibrillation and sudden death. WPW is usually easily detected on a routine EKG, and symptoms can be elucidated further in a cardiac stress test. 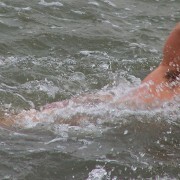 Becoming dizzy, short of breath and with low blood pressure while swimming can be disastrous, especially when at race pace, since it not easy to rest, recover, or get help quickly; being at risk of ventricular fibrillation because of an abnormal congenital electrical pathway as in the case of WPW while in open water is potentially lethal. If you have had previous undiagnosed spells of dizziness, fainting, palpitations, or tachycardia, having a routine EKG is prudent. If you have further suspicions, then seeing a cardiologist for more testing would be useful to confirm the diagnosis. Once familiar with the diagnosis, there are several treatments available, including cardiac medications, or electrical cardioversion; if the WPW is persistent or recurrent, there is a definitive, potentially curative treatment: the destruction of the abnormal electrical pathway by radiofrequency catheter ablation. This is a Latin term meaning “concussion of the heart”, and is a very unusual event caused by direct, blunt, non-penetrating trauma to the chest, perfectly timed to a vulnerable phase of the cardiac cycle (such as when ventricular polarization occurs), causing a spontaneous, sudden, fatal arrhythmia. It is suspected that the blunt force causes a significant transfer of kinetic energy to the heart, enough to disrupt the cardiac rhythm. Resuscitation of this event has been poor, even on land-based occurrences, such as with a baseball, a hockey puck or other blow striking the chest. Although such a blow has never been witnessed in a mass start swimming event (frankly, it is hard for anything to be observed out in open water), open water swimmers need to be aware that being struck on the chest by another swimmer’s heel kick could, at least in theory, have lethal consequences. The solution: steer clear of other swimmers, especially when overtaking someone slower. The two previous posts outlined the stimulating effects of cold water shock and the fight or flight response, which, when countered with a suppressing effects of the diving reflex, can lead to what is known as an autonomic conflict, causing a higher than normal risk of cardiac arrhythmia, a rare but potentially lethal event in open water swimming. This post reviews some other important physiological responses that open water swimmers may encounter. When fluid builds up your lungs to a point where it interferes with the ability to absorb oxygen, you will feel short of breath and your breathing rate increases. The diagnosis of SIPE has become more common in recent years, likely due to the popularity of endurance swimming and longer-distance triathlons and is thought to occur in about 1-2% of athletes doing swims longer than 2Km. These swimmers are more often female, in wetsuits, and competing in colder water. Other factors, such as sustained heavy exertion, excessive swim pre-hydration, a lack of a swim warm-up, a history of hypertension, the use of anti-inflammatory medications (such as ASA), and the use of fish oil supplements have also been associated with SIPE. Interestingly, SIPE does not seem to be associated with age, or with lung or heart disease. SIPE is characterized very simply as a combination of fairly sudden onset of shortness of breath and crackling sounds in the chest, associated with a cough productive of pink, frothy or blood-tinged secretions. It is thought that fluids from the pulmonary capillaries leak into the lungs’ air spaces (also known as “alveolar flooding”), in turn causing the shortness of breath, the crackling sounds in the chest, and the cough productive of a frothy pink (or blood-tinged) discharge. The good news is that it is usually self-limited after getting out of the water. Deaths from SIPE are rare. So what is going on here? Most likely, significant cold water immersion causes blood vessels in the arms and legs to close down to preserve heat (“peripheral vasoconstriction”), redirecting and increasing blood flow (“shunting”) blood to the chest and lungs. The peripheral vasoconstriction forces the left ventricle to pump harder which reduces the left ventricular stroke volume, and tends to back blood up into the lungs, increasing the blood back-pressure into the pulmonary circulation. This effect can be enhanced in thinner individuals who are more likely to feel the cold, or in swimmers who have not adequately warmed up, or with the wearing of a snug wetsuit, which causes more compression of the limbs and therefore further increases the shunting of blood flow to the lungs. On the other side of the heart, the right ventricle has to deal with the increased volume coming into the heart due to this shunting effect, which increases the blood pressure in the small arteries in the lungs. When there is increased blood pressure on either side of the delicate oxygen-absorbing tissues (the alveoli) in the lungs, the alveoli are swamped with blood, creating edema, and progressive shortness of breath, and blood-tinged sputum. SIPE is different than the cold shock response: SIPE only occurs after some significant exertional time in the water, although it seems to come out of nowhere very quickly; the cold shock response occurs within seconds of cold exposure, loading the heart so dramatically as to risk straining the heart with an ischemic event. SIPE is more likely to occur if there had been significant hydration prior to the event—more fluid on board, more fluid pressure in the lungs. Medicines like ASA-related drugs, which by their platelet inhibition increase bleeding tendencies, can also enhance SIPE by contributing to impairing the “bleeding tendency” in the alveoli. Fish oil supplements also have anti-platelet and vasodilatory effects, which would also enhance the development of SIPE. Since SIPE can also kill you, there are strategies here that are important to consider. Do not over-hydrate, especially before a cold water event. Warm up well. Do not take fish oil supplements or anti-inflammatory medications prior to the swim. Consider how tight your wetsuit is. Confirm that you do not have untreated hypertension – talk to your doctor about this. If you do develop a frothy pink productive cough, with shortness of breath, and the feeling of crackling sounds in your chest, get out of the water, and get prompt medical attention. Although many SIPE victims are admitted to hospital for assessment, treatment and observation, often just getting out of your wetsuit, rewarming, and time is all that is necessary. It appears that the entry of water into the trachea (such as choking on water while swimming) may be another possible potent trigger for dramatic slowing down of the heart rate, a response that can occur within just seconds of aspiration. In rats, the heart rate dropped to under 10 beats per minute, or even stopped, causing a dramatic drop in blood pressure, loss of consciousness and a terminal arrhythmia called ventricular fibrillation. This sensitivity of the trachea is thought to be increased with fatigue. Cardiac arrest would follow quickly. In open water conditions, irregular waves, collisions with other swimmers, and lack of experience in open water swimming may increase the risk of aspiration and the triggering of this reflex, which may trigger the above cascade of cardiac events–very quickly. Experience in open water swimming remains a key element of risk reduction to avoid this pattern of aspiration, as is improved breathing pattern flexibility, the ability to cough while the face is in water, and keeping clear of any unnecessary contact with other swimmers. A simple definition of Physiological: “the organic processes and phenomena of an organism or any of its parts or of a particular bodily process”. With the growth and immense popularity of open water swimming and triathlon in the last 15 years, a disturbing trend has come to light which is the disproportionate number of deaths in the swim portion of triathlons. The numbers are chilling. In the period 2007-2012 there have been 52 deaths recorded by Triathlon USA, and of those, 44 were in the swim portion of the race, and all of them were in open water, and not one in a pool. Why at the beginning of a race? No one is exhausted or dehydrated or overheated. Are there any trends to suggest an obvious explanation? Not really. These athletes were a mixture of young and old, male and female, experienced racers and rookies. These people have been in the beginning, the middle, and the end of a swim when they collapsed. The length of race did not seem to matter, whether sprint, Olympic or Ironman distance. They were in fresh and salt water. Some were even able to grasp onto a paddle board before going under, while some were never seen going under. And there are often few witnesses in the water nearby who could accurately describe what happened. The autopsies, when done, do not reliably show lungs full of water, damaged hearts, or significant trauma—since autopsies don’t show everything, they are frequently signed off as death by cardiac arrest. So can we learn anything from what is going on here? To maximize your ability to survive open water swimming, check out the following basic physiological reflexes that may be contributing to risk of sudden death in open water swimming. They are all easy to understand. The Cold Shock Response. No mystery here: jumping into cold water is a significant strain on your body (even when the lake is a comfortable 22°C, that is still 15°C less than your body temperature). Your heart rate and breathing rate spirals upward dramatically, as does your blood pressure (due to massive vasoconstriction in your limbs and skin), and your demand for oxygen (as your body now very dramatically needs to generate heat with shivering). In susceptible individuals, this cardiac strain can lead to angina, myocardial infarction, and potentially cardiac arrhythmias. The solution? Don’t jump or dive into cold water. Ease into it—walk into cool water if you can. Acclimatizing slowly each time you go. And swim in cool water regularly to get comfortable with cool water swimming. Your body can adjust without a shocking response if you give it a chance to. And of course, do not combine cold water swimming with alcohol or a variety of other drugs that might distort your feeling of the cold, which in turn would distort your perceptions of heat loss, and your risk of hypothermia. The Mammalian Diving Reflex. All mammals use a fundamental survival reflex when diving to conserve oxygen use—this allows aquatic mammals (e.g., seals, dolphins, whales, walruses) and diving birds like penguins to stay underwater for extended periods of time. This reflex is also evident in humans (especially in infants), and has clear implications when swimming in open water. How does this work? When the face specifically is submerged and exposed to cold water, nerve receptors in the face relay this information to the brain and the vagus nerve to dramatically slow the heart rate (called bradycardia) and the urge to breathe. Blood supply to the periphery is also constricted, to further reduce oxygen demand. The degree of the effect is proportional to the coldness of the water, and it is increased further with breath-holding. Unlike the cold shock response described above, it is not triggered with the limbs or body contacting cold water. How cold does the water have to be? Although one source suggests 16C or less, the reflex likely varies with how well you are acclimatized to cold water (one the day, and over time), as well as your overall health and fitness. Chances are if it feels cold to you, it is cold enough to elicit a diving reflex. To lessen the effect of the diving reflex, two things are important: First, get used to swimming in cool open water, by going out into it regularly. And second, initially splashing water on the face before fully entering the water to swim is important. If the water is particularly cold (16C/61F or less), you might consider a series of short swims of only 15-30 seconds, standing with head out of the water in between, to acclimatize the face to the cold. Check your pulse in your neck before you enter the water, and after you have acclimatized to get a sense of how you are doing. Open water swimmers transitioning from the pool will have some new equipment variables: primarily this is about a wetsuit, but even goggles and a swim cap have to be reconsidered. Since most swimming in open water is colder than the average pool, a wetsuit becomes necessary for insulation, especially for longer swims, since the average body temperature of 37°C, is about 15-20° warmer than most Northern hemisphere swims. A wetsuit has other advantages as well: A wetsuit improves floatation, which is an added safety feature for open water swimmers, and it improves the body position. 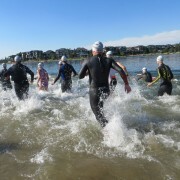 Most open water swimmers have faster swim times in open water due to wearing a wetsuit for this reason. A wetsuit however ‘can’ have some potential problems, especially for newbie open water swimmers. There can be a feeling of chest and/or neck constriction to get comfortable with, and this may be worsened if the wetsuit is ill-fitting, which commonly happens when someone borrows a friend’s wetsuit. Given that a wetsuit creates a feeling of overall body constriction even before entering the water, it can contribute to swimmers feeling like they can’t breathe as easily. This feeling can cause a swimmer to become anxious and it can undermine an open water swim. Once you make a commitment to regular open water swimming, get a wetsuit properly fitted to your body—many sports shops and wetsuit companies will let you try them even in open water before purchase. Another common area of restriction is in the shoulders, which, for some swimmers, starts to feel like a fight with your wetsuit with every forward reach or your arm. If your wetsuit is otherwise a good fit, two corrections can help: First, make sure your wetsuit is pulled up into your crotch, to allow as much neoprene as possible for the torso to maneuver in; and second, make sure the sleeves are pulled well up, to allow some redundancy in the shoulders. Try moving your shoulders before getting into the water, adjusting parts of the wetsuit as necessary. Once you have made your shoulder, knee area, and crotch adjustments, lean forward in a toe touching motion. This will provide a little more stretch in the critical areas of shoulder, crotch, and knees. An old or excessively loose wetsuit can be problematic as well. When excessive leaks or rushes of cool (and especially cold) water continue to affect an open water swimmer, the process can drain the swimmer of energy fighting the cold, and cause more breathing difficulties due to the physiological reflex called the cold shock response. Get a wetsuit that fits, and replace it once the number of holes or zipper problems can no longer be repaired. Although goggles have essentially the same purpose as they do in the pool, there are some considerations here as well. First, consider using tinted goggles to reduce glare, reflections and direct sunshine when in open water. Second, make sure your goggles are good fitting, since a leaky set of goggles are more of a challenge to clear in open water than in a pool, where it is easy to stand, and readjust the goggles. Since all of us have different-shaped faces, a goggle choice that fits your face is personal, but once you find a brand that fits you well, stay with that brand, and always have a relatively new pair in the wings when your old ones are becoming stained, or scratched or easily fogged up. For larger swim events, you need to have reliable goggles. If you do find yourself with a collection of water in your goggles in the middle of an open water swim, roll onto your back, and just pull your goggles off your face to drain the water, and then push them gently back onto your face to reseal them. 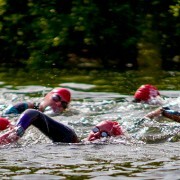 There are two considerations in your choice of swim cap in open water for warmth and for visibility. For water temperatures above 20°C, an ordinary latex cap is usually adequate. Between 15-20°C, a silicone cap would provide improved insulation and can be pulled down to cover most of your forehead. Under 15°C, consider double capping with 2 silicone caps. Under 10°C, consider a neoprene cap. Latex caps tend to fit a bit larger so make sure you have a cap that fits your head properly. A sliding cap while you are swimming detracts from your focus and comfort. Since swimmers are about 80% submerged, are often wearing black neoprene, and can be hard to see in even light swells by watercraft, a brightly-colored swim cap is important to enhance visibility. In the last 10 years, the International Swim Hall of Fame in Florida has been promoting the use of the safety swim buoy, an inflated, beach ball-sized, dual-chambered, brightly colored marker than swimmers tow behind them to be seen and monitored more easily. Some versions can also carry personal items in a dry inner chamber for point-to-point swims, or to keep personal effects with you. Most swimming events in Asia have long made them mandatory, as has some in England and now in Canada. Although they cannot be sold as a personal floatation device, since they have the theoretical risk of suddenly deflating, they can nonetheless give an anxious swimmer something to hang on to, to rest or calm down. The only company selling these in Canada at this time is at getaswimbuddy.com. It may seem counter-intuitive, but towing a small inflated open water swim buoy does not actually cause sufficient drag to slow you down. The bow wave that is created by your shoulders and upper body creates an eddy behind you, which actually pushes the buoy forward, virtually eliminating any possibility of drag. And because the short lease attachment allows the safety swim buoy to float over the bend of your knees, it is out of the way of the finish of your hand at the end of your arm stroke; and since it does not reach past the upper calves, your kick is also unaffected. As safety concerns continue to ramp up in the coming years in the sport of open water swimming, expect to see the personal swim buoy as a fixture in both training and races. Last week, we explored some of the factors that increase anxiety when swimming in open water, such as the decreased feeling of safety, the uncertainty of the bottom, the expansiveness of open water environments, and the risk of body contact in open water swim events. This week’s post will cover several more sources of anxiety. Pools are generally sterile, chlorinated, clean tasting, clear or turquoise looking in appearance and free of debris. Open water however, such as rivers, lakes and oceans are living milieus of fresh and or salt water. Open water can have a noticeable taste, be it salty or brackish, earthy, muddy, and or silty. There can also be hints of manmade flavours, including oil or gas from watercraft, and other industrial forms of pollution. The bottom can be sandy, rocky, muddy, weedy, or you may not see the bottom at all. Not seeing the bottom can cause new (and even some seasoned) open water swimmers to feel anxious. These worry factors (if you have them) take time and effort to get used to. There are, of course, some waters just not worth swimming in, and it pays to understand what you are getting into before you get into it. You also have to share an environment with all kinds of aquatic life, from insects to fish, from waterfowl to mammals large and small. Most fish and birds are more afraid of you than you should be of them, and encounters with aquatic mammals would be very unusual (including Ogopogo and Loch Nessie!). Since swimmers are usually about 80% submerged, swimming in open water makes it more difficult for a swimmer to be easily seen, especially when wearing a black wetsuit and swimming outside of standard enclosed swim areas. Power boats, paddlers, windsurfers, water-skiers, and fishermen may not see you, and may not even be expecting to see you if you are in areas not commonly swum in. Think twice before venturing off the beaten track where watercraft are common, and if you do, consider having boat or paddlers’ support to protect you, so that you can concentrate on swimming. Swimming in a group, even if it is a small one, will increase the likelihood of being seen, as well as wearing a brightly coloured swim cap, and/or using an open water swim buoy, such as a “Swim Buddy” or another safety swim buoy. Floating debris can be particularly anxiety provoking for an open water swimmer. Having something touch you unexpectedly, or something floating that you swim into can cause instant anxiety until it is clear what has touched you. We often, as a self-preservation strategy, fear the worst when this kind of contact happens. Most often it is only a stick, branch, leaves, weeds, or other floating debris. Other things can just be annoying, such as films of pollens or leaves on the water, small oil slicks, or water clouded up by other people’s activities. It is only experienced in open water that helps swimmers get used to these variables. A bright sun-lit morning is a great time to swim but you do need to prepare for looking into the sun and any reflections or glare coming off the water. These factors can really affect your sighting abilities, which may cause you to go off course. Tinted goggles can help, as can surveying the course you intend to swim. Alternately, a rainy day may have an opposite effect, with low-lying cloud obscuring reliable sighting points, the risk of thunder and lightning, changes in water temperature, currents, waves, and the wind, all of which could threaten the safety of your open water swim. Plan your open water swims like a pilot does – start by checking the weather forecast, getting your open water swim buoy and swim gear ready, and completing your open water swim checklist. Uncertainty generates anxiety. The more uncertainties you have about something, the more overwhelmed you can become. Being anxious while swimming in open water may seem to be primarily the result of worrying about one thing, but just as often it can be a function of several uncertainties added together to make a very uncomfortable feeling. Just like feeling anxious about many unknowns when first out hiking or camping in the wilderness, or when jumping off a zip-line platform for the first time, each of these lesser fears need to be recognized, understood, and put into perspective before open water swimming can become truly enjoyable. In a pool, you have a strong sense of security and safety: you are never far from a lane rope, the pool’s edge, the pool bottom, other swimmers, or a lifeguard; you can usually get immediate attention if needed, you don’t have an open water swim buoy. In open water, you do not have these same securities. In the case of open water, once you trust your ability to float easily for extended periods of time, you will recognize you are in no immediate danger, more so when using a safety swim buoy. Be proactive: before the start of every open water swim training session or event, seek to understand what the hazards are in the water you are choosing to swim in, and what safety resources are available (such as currents, rocks, lifeguards, rest areas, etc. ), and make sure your open water swim buoy is ready to go. There is no substitute for the open water experience and intimate knowledge of the swim area. Just like any contract you are about to sign, make the effort to know what you are getting yourself into–before you get into it. In a pool, you can easily see the bottom, and you can easily make out where the shallow and deep ends are. Lakes, rivers, and oceans obviously do not provide these same markers or assurances; instead, open water swimmers will have to come to realize that the depth of the water is actually irrelevant to most swimming, which only occurs at the surface of the water. Some swimmers have a fear that, unless they are constantly moving, kicking, or stroking with their arms, they will sink, and drown. However, a simple drill will settle that for most people: In 3-5 feet of water in a lake or ocean, try going down to sit on the bottom for even a few seconds. You will quickly discover that you will have a tendency to bob up like a cork, which is especially true if you have a wetsuit on or you are in salt water. Open water doesn’t want to swallow you, rather it wants to spit you out! The wetsuit, along with the air you have in your chest, makes you buoyant, a natural PFD. Try this until you can fully believe that the water will keep you at the surface without much, if any, effort from you. In a pool setting, the defined borders of the space are easy to encapsulate in your mind’s eye with a quick glance. Open water settings however, can appear expansive, without a clear sense of the distance you must travel to safety or the finish line. This is especially true in a point-to-point swim, and this can be intimidating. Swimming 2000 meters in a pool seems both very safe and very doable, since you are never swimming more than 50 meters at a time before contacting a wall. Such a short distance is easily visualized in a pool, and 40 laps of 50 meters mentally seems easier than 2000 continuous meters in open water, where there are no breaks or wall push-offs. If for whatever reason you cannot finish the distance in a pool, you can just stop and get out of the pool. 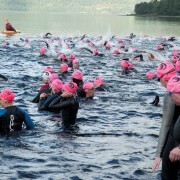 For the open water newbie, confidence in your training and your abilities are necessary. And, it may be easier to chunk down your swim in bigger pieces, such as going from marker to marker, since there are no walls to turn off of. Or think of an extended open water swim as a meditation, enjoying the journey more than fixating on the destination. Success here is in the perspective. We recommend the use of an safety swim buoy to further reduce your swimming anxiety. 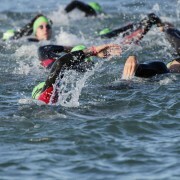 In an open water swim or in triathlon events (where mass starts are common), the first few hundred meters can be chaotic, with random, repeated, and sometimes significant contact by fellow swimmers. Flailing arms and hands and kicking feet of hundreds of swimmers in a small area can feel like swimming in a washing machine. This experience can be very distracting, uncomfortable, and anxiety-provoking even for experienced swimmers. To minimize this contact, you need to stay in control of the sphere around you: position yourself off to one side, and/or delay your start even just a few seconds to let faster swimmers go ahead of you. Start when you are ready and when a path seems clear, and have well-developed sighting skills to swim straight, thereby avoiding the tendency to swim into the side of another swimmer.